Serenity - I think we all know it best as baby blue, is one of the two selected Pantone's colour of the year. I have a strange relationship to blue. When people put colours in front of me and ask me which ones I am drawn to, nine times out of ten I will choose blue, no matter what shade it is. Serenity blue can be a challenge to style (as it is a pastel), especially if you tend to be edgier with your wardrobe. A blue jacket, a blue top, dress, or skirt against any other colour looks stunning and has a quality of fresh but luxurious and quite a refined vibe to it. If you’re not a fan of pastel hues, you may start incorporating these Pantone 2016’s colours with your accessories like bag, shoes, scarf, belt and jewellery. Wearing Serenity coloured bag will add a pop of colour without being too dramatic or loud. When wearing the Pantone hues in a monochromatic style, always add interest by contrasting fabrics like a lace blouse with a chiffon skirt or a knitted top with a pair of sleek pants. 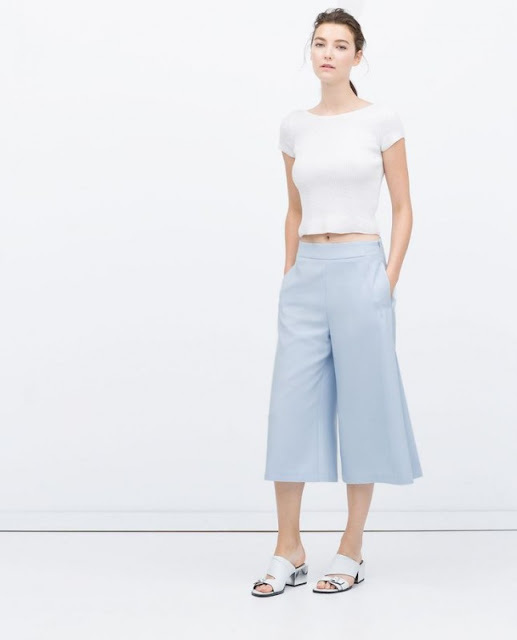 Skirts, and even dress pants like culottes in Serenity look great with basic tops. Just go for muted shades like neutrals or pastels to avoid overshadowing your Pantone palette. This colour choice can be great for your office outfit, fancy outfit, and even casual-chic looks that call for a feminine and gentle fashion style. Still feeling unsure how to pull this colour off, see below for street style inspiration to make you feel more confident in wearing this colour.